One sharp strike against a music stand and a flick of a wrist sends sounds of strings thrumming into a second-floor classroom of Jean Brown Theater. Foreheads crinkle in concentration, but never look down at their hands. 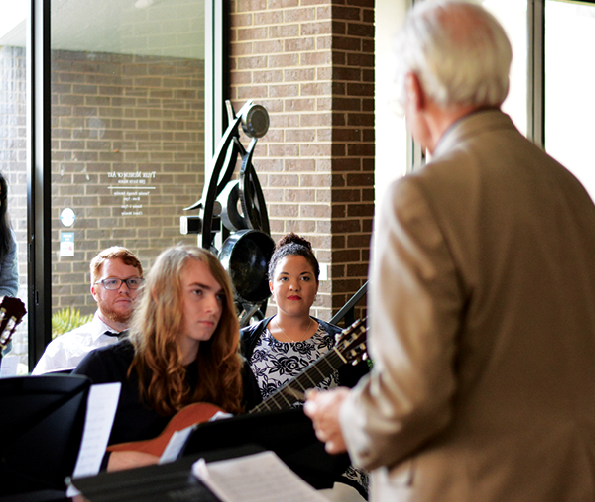 The students are entrusting director Franklin Kimlicko as he leads his guitarists through each bold note of the nine Latin pieces they are rehearsing for the Tyler Museum of Art’s coffee house program. Balance between the feel of the music and the diligence of technique is something Kimlicko embodied as he broke into a small samba to the Latin guitar. With a wave of his hand, he easily corrected a misplaced note of his students.’ Live music means being in the moment, and thinking on one’s feet was part of it. “It will happen now and then. Something doesn’t go quite right and you have to adjust immediately. Immediately, so that that magic moment is not lost for the audience. Because once you start, hopefully we have this thing called ‘suspension of disbelief,’ and that will be the sweet spot, right? When they’re truly into it,” Kimlicko said. The first song of the rehearsal ended and the room was met with the dull groans of tuners being twisted as the students adjusted their instruments. Jacob Mills sat in the second chair preparing for his part. His professor raised his baton, and Mills flew into his solo. His fingers moved deftly through the strings. This was exactly where Mills needed to be. Behind the guitar, there was a sanctuary that shielded him from the doubters, his detractors, people in his life that badgered him daily to fall into majors he didn’t love. Not the way he loved this. The rhythm of his life only ever felt in sync when he was tapping his foot, keeping time. “As a musician, we’re told stuff like, ‘Your degree is not worth anything. How are you ever going to find a job?’ But, I can’t really imagine myself doing anything else without being completely miserable. So it’s this or nothing at all, really,” Mills said.